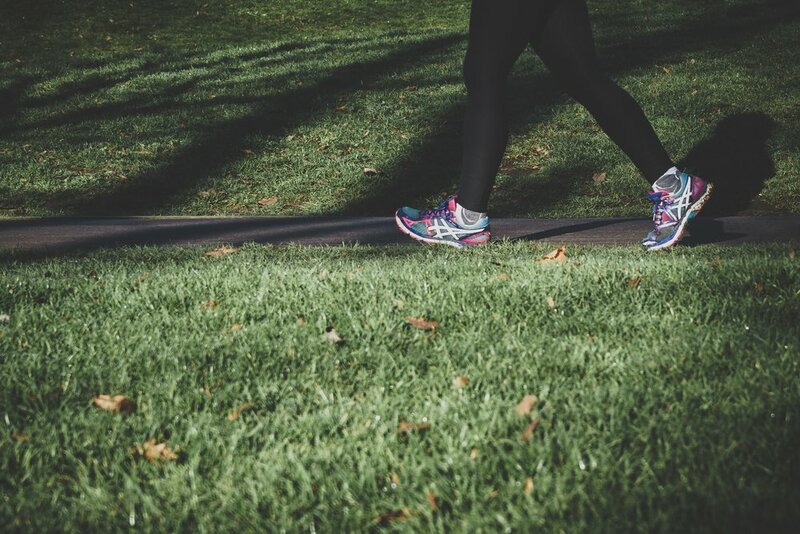 Walking is seriously good for all aspects of human health, and it’s probably the easiest way to get started with a fitness routine. It doesn’t require fancy equipment, a gym membership, or complex movements. All you have to do is put one foot in front of the other! Reduces risk of heart disease. Yes, even 10 minutes of walking can improve heart health! So don’t let your busy schedule get in the way of your health just because you can’t squeeze in 30 or 60 continuous minutes of exercise! Reduces stress. Stepping away from your desk, the laundry, or your hormonal tweenager for 10 minutes is better than any medicine money can buy! The stress reduction effect is even better when you walk outside in the fresh air and natural light. Improves bone health. Walking forces your body to work against gravity which makes it a weight-bearing exercise. Aside from eating foods rich in calcium such as spinach or yogurt, the best way to maintain bone strength is to do weight-bearing exercise. Sparks creativity. My best ideas have come to me when walking outdoors (I even carry a notepad with me to write things down). Walking increases blood circulation to your heart, muscles, and brain. So rather than trying to fuel your creative juices or that mid-afternoon slump with caffeine, try taking a 10 minute walk! It’s the most natural form of human movement. From a biological and historical perspective our bodies are built for walking – and lots of it. Estimates indicate that our ancestors walked between 5 and 10 miles every day. We’d all do well to follow the wisdom of our biology and forefathers. Reduces pain. The vast majority of chronic pain is caused by underuse, not overuse! Muscles, tendons, and ligaments become tight and stiff when not in use. Walking for even 10 minutes can increase blood flow to these tissues, stretch tight muscles, increase joint lubrication, and decrease pain. It’s virtually free. No gym membership or expensive equipment is necessary to do the most natural basic form of human movement. All you need is a decent pair of shoes and comfortable clothes — if you’re on trend, you’re probably wearing yoga leggings right now anyway! You don’t need much more than that to start walking. It burns calories. A brisk 10-minute walk can burn up to 50 calories. Will it help you lose 30 lbs. by next Friday? No. But over time the calorie burn from being active more often can really add up. You can do it anywhere. You can walk around your house or office. You can go outside and walk around the block. You can step in place next to your desk. You can move about the airplane cabin when the “fasten seat belt sign” is off. Point is: walking can be done almost anywhere and is easier to fit into a busy schedule than pretty much any other kind of exercise. Improved quality of life. With all the benefits of walking I just listed above, it’s hard to argue with this one! It’s not about increasing your lifespan (though walking can help with that), it’s about being functional and happy for however many years you have left! This is pretty easy, really. Just put one foot in front of the other! To make it more fun queue up three or four of your favorite songs on your phone or Ipod and commit to walk until the songs are over. Clear 10 minutes in your schedule to do this every day, preferably earlier in the day (to avoid the late-day rush that most of us face) and walk outdoors when possible. As your fitness level builds, start adding in a few intervals or walk someplace with hills. A simple interval to get you started would be 30 seconds of speed-walking followed by 90 seconds at your normal pace. Do this until the 10 minutes is up.